By default, a drawing layer can be animated, but Harmony lets you disable this feature. Being able to switch your drawings so they can no longer be animated without a peg has certain advantages. It means that you can access the drawing substitution feature for this drawing layer, while being able to create keyframes on its parent peg. This feature is also available for backward compatibility when bringing in templates created in older versions of Harmony, so as not to lose their offset keyframes or drawing substitution keyframes. When selecting the element in the Camera view, the actual drawing layer is selected, but the motion you will create will automatically be transposed to the peg layer. You cannot animate (add keyframes) directly onto the drawing layer if the option is disabled. You will still be able to perform certain offset movements in the Transformation tab of the Layer Properties, but not using any of the animation tools in the Tools toolbar. There are two ways to disable animation on drawing layers, via the Layer Properties window and the Preferences dialog box. When you disable animation in the Layer Properties window, it affects only the selected layer and not any others. If you prefer this style of animation and want every drawing element that you create to not be animated, you can disable the Element Node “Animate Using Animation Tools” Default Value preference. This will disable the Animate Using Animation Tools option on all the new layers you will create from that point on so you don't have to do this through the Layers Properties window for every layer. It is recommended to disable this preference before starting a new character rig. The Layer Properties dialog opens. 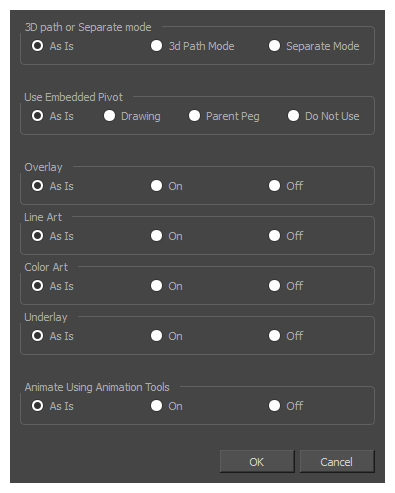 Uncheck the Animate Using Animation Tools option. Notice that the layer functions are no longer available in the Timeline view. Right-click on the Timeline toolbar and select Customize. The Toolbar Manager dialog will appear. In the Available Tools list, Scroll down to the TB_Set_properties_on_many_Layers in TB_Set_properties_on_many_Layers.js function. Click on the Add the selected tool to the toolbar button. In the Timeline view, select all the layers for which you want to disable animation. In the Timeline toolbar, click on Set Properties on Many Layers button. The Set Properties on Many Layers dialog appears. Under Animate Using Animation Tools, select Off. Uncheck the Element Node "Animate Using Animation Tools" Default Value option.